All quality plants arrive potted! No seeds, No bulbs, No bare rooted plantlets...This Means - No Waiting! Famous plant known for it's jaw-like traps. 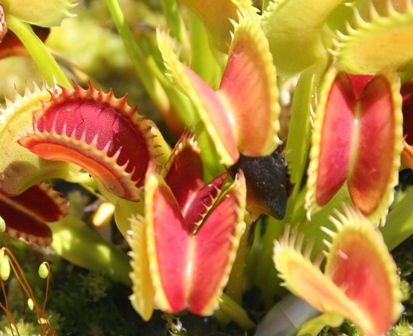 Venus Fly Traps are carnivorous plants that lure, capture and digest insects. If the prey attracted by the sweet odor touches the trigger hairs inside the trap, it will snap shut catching its victim. Adds a new dimension of activity to the terrarium. This variety has toothed traps instead of the normal spikes. Please Note: Plants sold from fall through spring are generally smaller than those offered throughout the rest of the year. Venus Fly Trap - "King Henry"